A couple of weeks ago I was lucky enough to win a giveaway by Reneissance Cosmetics on their Facebook page and when my parcel arrived I couldn’t wait to get the polishes on my nails. The prize consisted of two full-size polishes from their Love… Everyday collection – Rosie-Osie and Black Heart, Don’t Care as well as a 5 ml cuticle oil. When I mentioned I’m a blogger Meghan was kind enough to add mini bottles of Love… Everyday and L’hiver to the package! Don’t they all look amazing? See the full post for swatches and descriptions of each one! I was excited to try these polishes both because they are beautiful colours from a relatively new indie brand, and because one of the makers is one of my absolute favourite bloggers! Meghan of Will Paint Nails For Food started Renaissance Cosmetics along with her sister Laura. Her blog is one of the first I always check and I’ve been envying her amazing photos and perfect hand pose for months… not to mention the nail art! If you don’t already follow her blog, go check it out! Here’s what I got in my exciting little parcel: I didn’t know what to try first! I’ll start by showing you the three polishes I have from the Love… Everyday collection. The collection also contains a fourth polish, Taffeta Gown. 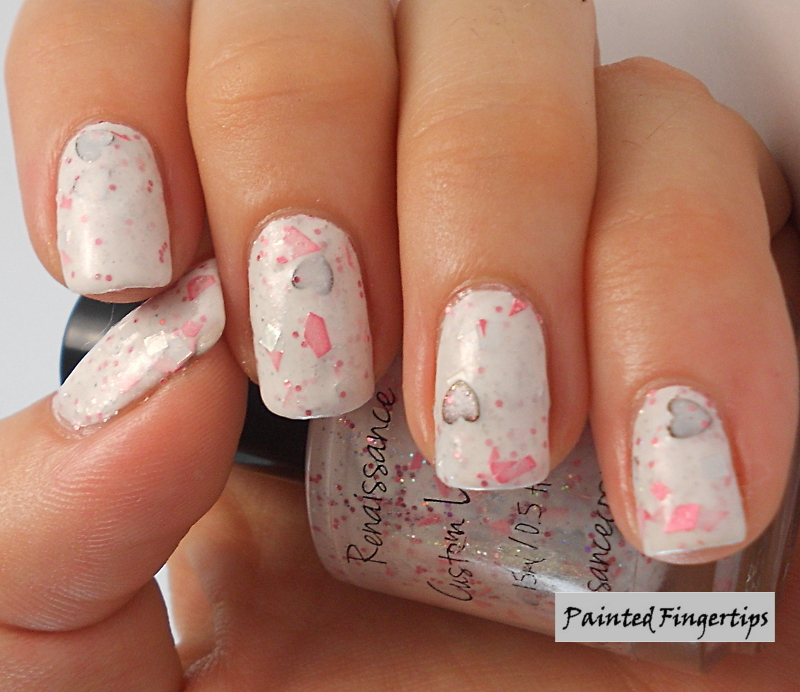 These polishes are inspired by Valentine’s Day but are absolutely wearable year-round. First up is Black Heart, Don’t Care: This was the polish I was most excited about. White crelly-based glitters are huge at the moment but this is my first one. It’s also completely different to any others I’ve seen! The combination of glitters is absolutely unique and amazing. Black Heart, Don’t care is a white crelly base with black hearts, small pink circle glitters, pink shards, silver holo squares, tiny silver glitters, and a subtle red shimmer. The hearts do require some fishing but the other glitters apply beautifully and easily. Shown is three coats on its own. 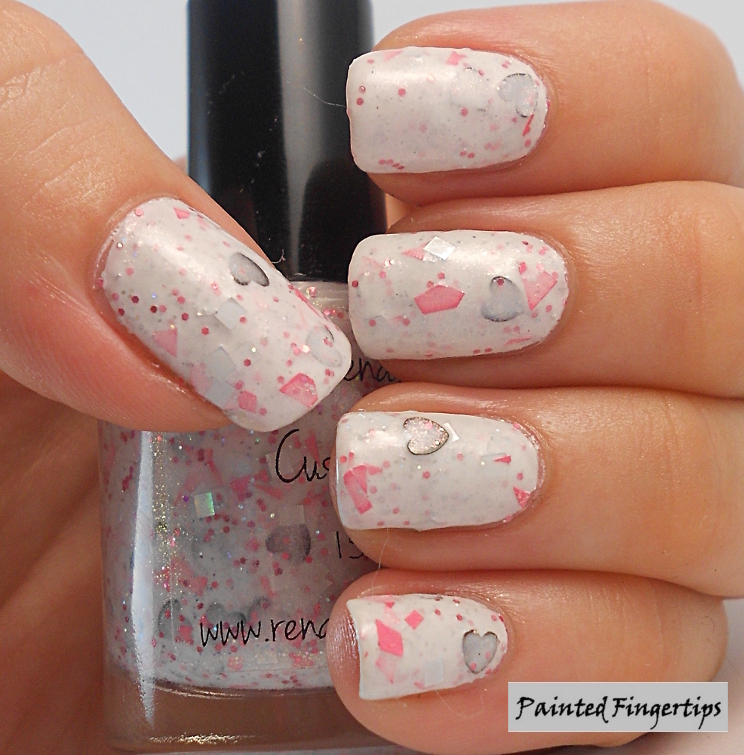 I didn’t try layering it but it is also recommended to layer it over a white or soft pink polish. I absolutely love this polish, it’s like instant nail art in a bottle! I am crazy about the pink shards which make this polish really unique. Black Heart, Don’t Care is available for purchase here. Next up is Rosie-Osie. If you’re a regular viewer here on Painted Fingertips you may have noticed that you don’t see pink or red nails here all that often. That’s because I’m not often drawn to what I see as the more ‘traditional’ nail colours… but luckily there is nothing traditional about Rosie-Osie! 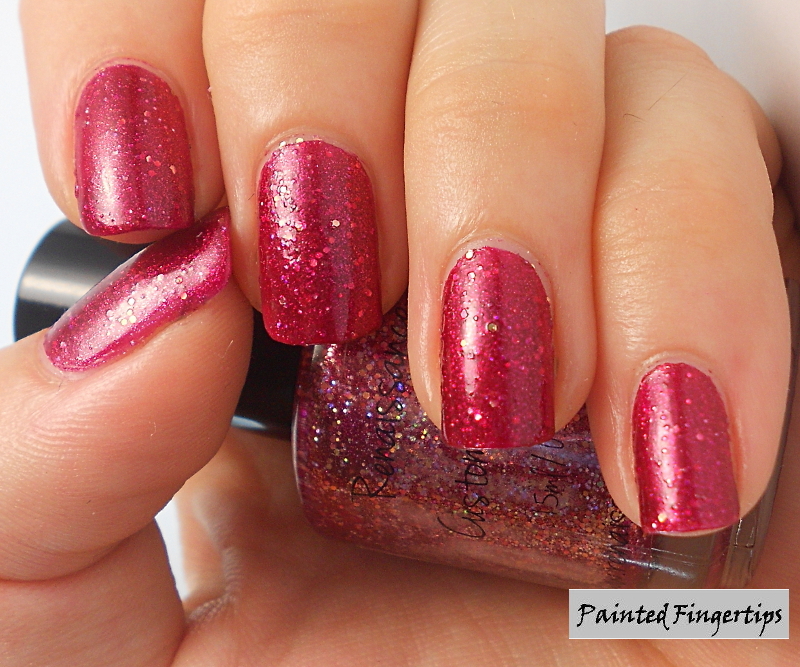 Rosie-Osie is a stunning pink-leaning red with silver and gold glitters and a spectacular red shimmer. The polish applies really smoothly and easily and the brush is easy to work with. It’s beautiful… but the most impressive thing about this polish? Even though the base has a squishy jellyish look to it, this is just ONE glorious coat! It was a slightly thicker coat but still – the polish just naturally applied that way and I got this fantastic coverage. If you apply thinner coats or if you’re concerned about the slightest visible nail line then you might need a second coat. I absolutely love this polish. This is one red I will definitely be wearing again and again! In fact, I already used it in some nail art I showed last week. Next time I’ll be sure not to cover up so much of its goodness. Rosie-Osie is available for purchase here. The third polish I have is the one the collection is named for: Love… Everyday. I had a mini bottle of this one which was a little hard to photograph with so I just used my usual top coat bottle. Love… Everyday is a soft pink polish with tiny gold and purple glitter and a pink/gold shimmer. Application was a little trickier with the mini bottle but the polish itself applied well, the smaller brush was just slightly harder to work with. This is two coats. This is a beautifully delicate polish and the shimmer really makes it. Love… Everyday is available for purchase here. The fourth and final polish I have to show you is L’Hiver (Winter). This polish comes from the Seasons Collection, which consists of one polish for each of the four seasons. Meghan mentioned to me that this was their most popular shade, and I can see why! It’s lovely. 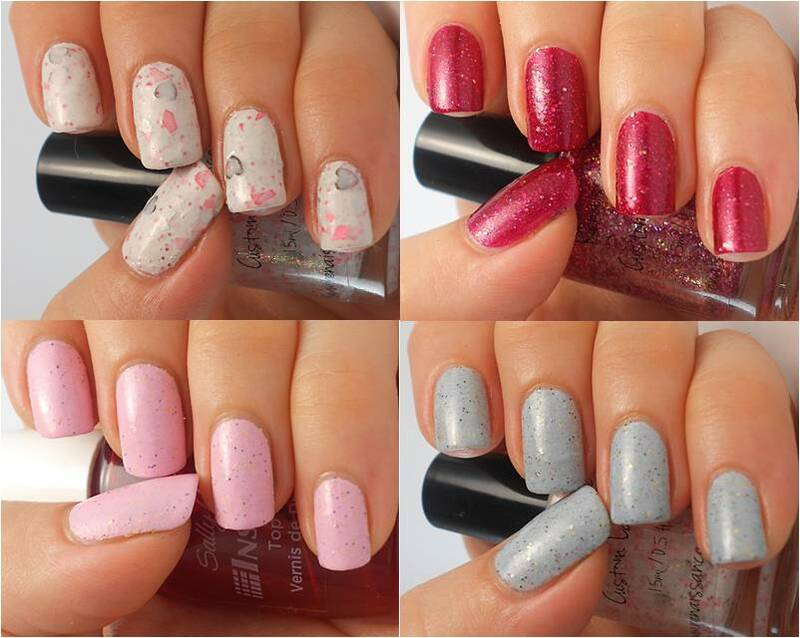 L’Hiver is an ice blue creme base with small gold and white glitters and tiny pink and dark blue glitters. Again, I have a mini bottle of this (I’m holding Black Heart, Don’t Care in photos) so the small brush was a little harder to work with but the formula was great. This is two coats. The blue base pulls just grey enough to seem really cold. This polish made me think of the coldest bite of winter on your face as you step outside on a frosty morning. Even though winter isn’t my favourite season, this polish is gorgeous and it represents at least one thing that’s good about winter. L’Hiver is available for purchase here. I also received a cuticle oil which I’ve been using ever since. Several scents are available and I picked Orange Cinnamon. The scent is really great and spicy – I think there’s a little clove in there as well – and not overpowering. The oil soaks in well and moisturises effectively. There are several scents available here if you’d like to try it. 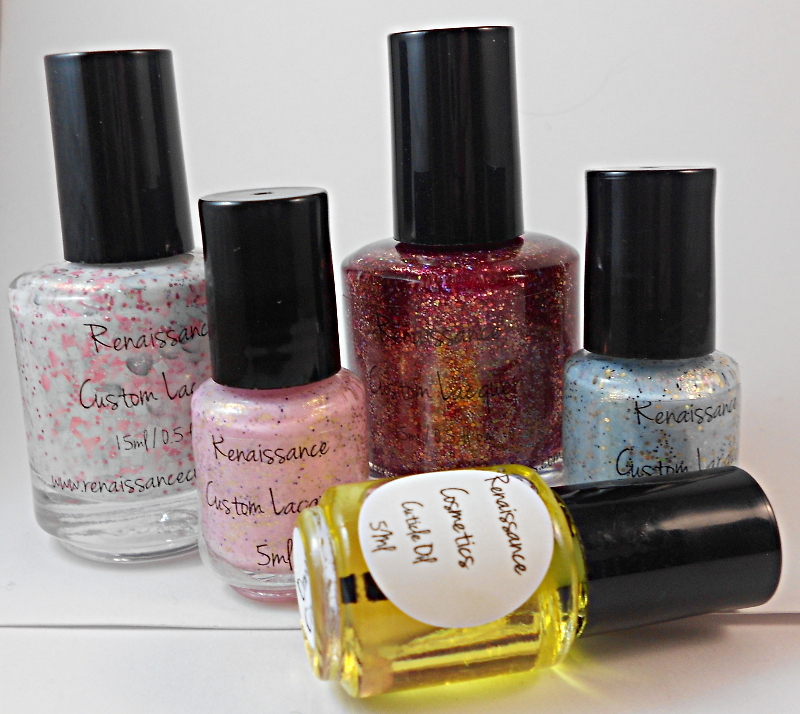 What do you think of these polishes from Renaissance Cosmetics? Do you love them as much as I do? Ooooooh yes! I looooove them! Rosie osie is wow wow wow! Black heart I don’t care is stunning! Ja wow! They’re all stunning! I know right??! Lucky meeee! I loved Rosie Osie so much more in person and the shards and hearts in Black Heart Don’t Care are freaking awesome.